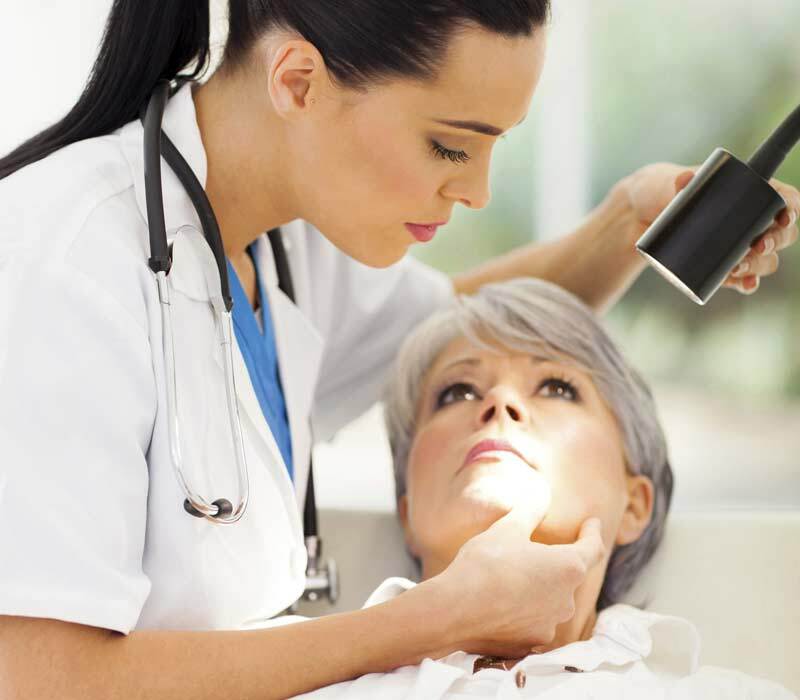 Flawless skin is highly desirable among people of all ages. Although any skin problem can cause great discomfort, people are especially impacted by breakouts on the face. Depending on how disfiguring the condition is, right up there with a bad smile, it can cause anxiety and severely impact quality of life. Peri-oral dermatitis literally means a rash around the skin of the mouth. Most people go to a physician or dermatologist (skin specialist) for relief but a rash that spreads primarily around the mouth is also commonly seen and treated at the dental office. In fact, if it persists over a long period of time it's quite likely to first be seen by your dentist. Often mistaken for acne and other common skin conditions, peri-oral dermatitis appears as a red scaly rash on the surface of the skin. 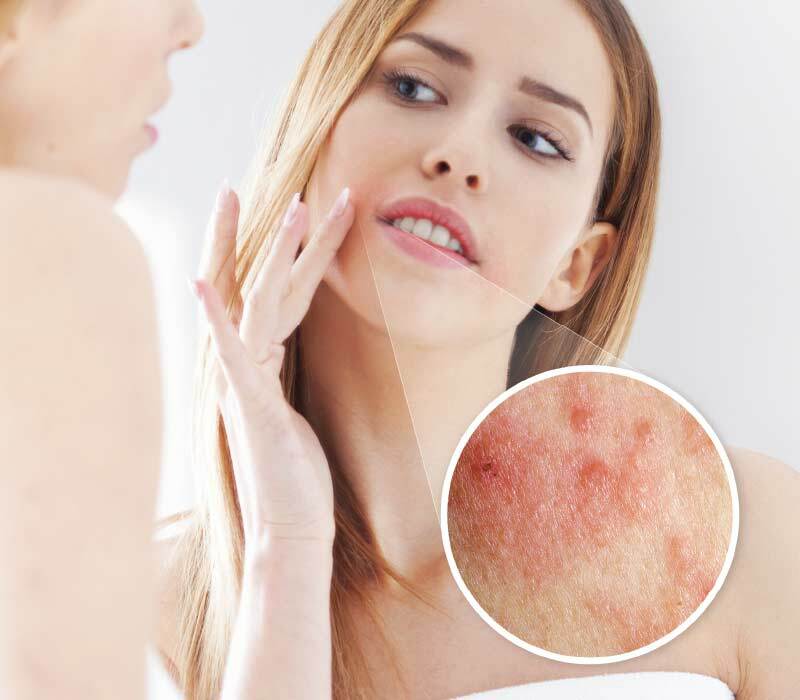 As is the case with most common skin conditions, its exact cause is unknown but it has been noted as an intolerance reaction of facial skin to repetitive irritation. It is predominately seen among women between the ages of 20-45 but has also been reported in children. Even though its incidence is lower in men, that number is rising, supposedly due to changes in cosmetic habits. Peri-oral dermatitis has an estimated incidence of 0.5 - 1% in industrialized countries although that number is lower in developing countries. Over the past twenty years there has been a decrease in the number of cases in the UK while it is seen more frequently in the US, Australia, and South Africa. What Is This Mystery Rash? Peri-oral dermatitis, a red scaly rash around the mouth, is most commonly seen in women ages 20-45. Peri-oral dermatitis was first described in 1957 by Drs. Frumess and Lewis who declared it a distinct skin condition. They described it as characteristically occurring in cycles, almost exclusively in young women. They noted that it ran a sudden and unaccountable course apparently unaffected by any kind of treatment. For the most part the clinical description of the disease holds true today, its unique clinical presentation sets it apart from other facial rashes. The red scaly rash is characterized by: small (1 - 2 mm) red papules (bumps); small pustules (pus filled pimples); and/or vesicles (blisters). They are localized to the area around the mouth, nostrils, or eyes while the lips remains unaffected. Peri-oral dermatitis can be asymptomatic but has been known to cause stinging, itching, and burning. The good news is that it is treatable by your dentist, physician or dermatologist who can provide relief in a number of ways. Clinical evidence suggests, however, that prolonged use of topical steroids is one of the most common risk factors for peri-oral dermatitis. Topical steroids are anti-inflammatory ointments or lotions, now available over-the-counter (OTC), to treat a number of skin conditions. Clinical evidence suggests, however, that prolonged use of topical steroids is one of the most common risk factors for peri-oral dermatitis. Combination products that contain a topical steroid with an antifungal agent are particularly common culprits. 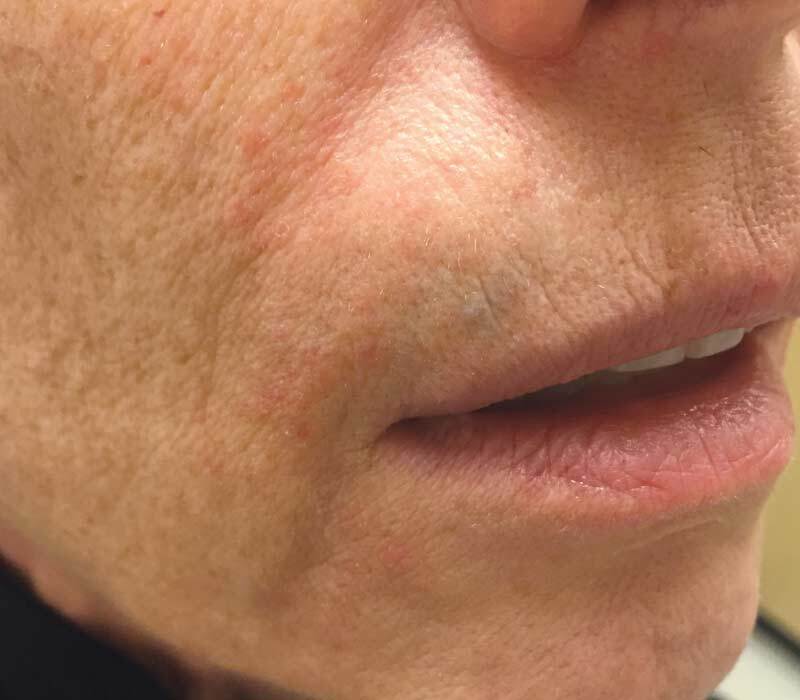 Ironically applying topical steroids to peri-oral dermatitis causes a constriction of the tiny blood vessels to the affected skin initially making it look better. This effect is almost immediate but short-lived; within 30 - 60 minutes it disappears. Continued use, because of the immediate benefit, unknowingly worsens and perpetuates the condition. The steroids actually suppress the normal inflammatory and healing effects of the skin leading to a flare-up after the medication is stopped. The worsening condition leads to reuse of the steroids to get the rash under control again, setting up a vicious cycle. Continued use leads to steroid "addiction" since it provides only temporary relief, actually causing the rash to worsen over time — a so-called rebound. Long term or excessive use of topical steroids can also cause thinning of the skin and make it susceptible to infections. Steroid-induced peri-oral dermatitis is commonly seen and may be related in part to a proliferation of bacteria in the tiny hair follicles of the face. It frequently leads to local immune resistance and suppression of normal healing, which leads to an overgrowth of various bacteria, yeast, Demodex mites or other organisms. Peri-oral dermatitis has also been associated with inhaled steroids used for asthma, cosmetics, toothpaste additives, and physical factors like heat and UV light. The fact that it predominately affects females suggests that hormonal factors may also play a role. Physical sunscreens with high sun protection factors may cause it in children. Moisturizers used on the skin of the face and chin can also cause immediate improvement of peri-oral dermatitis but also clog and disrupt the hair follicles. There's a bottom line here — only use topical steroids sparingly and for short periods of time. If a rash around the mouth doesn't clear up or returns, see your doctor, dentist or a dermatologist (skin specialist) for a proper diagnosis and appropriate treatment. Peri-oral dermatitis can often be confused with allergic contact dermatitis (an allergic response to agents, soaps, or cosmetics used on the skin), irritant contact dermatitis (irritants that damage or remove the skin surface), acne rosacea (a nodular raised, reddened form of an acne rash), and seborrheic dermatitis (a scaly and reddened inflammatory condition of the skin). But the clinical presentation and disease-causing mechanisms of these conditions are quite distinct. In some instances toothpastes can cause rashes around the mouth and should be discontinued or replaced. Occasionally fluoridated toothpastes are the culprits and should be replaced with non-fluoridated alternatives. Peri-oral dermatitis is usually diagnosed by visual examination, looking at the characteristics of the rash and paying close attention to the type of rash and its exact location. In case a definitive diagnosis cannot be reached or treatment is ineffective your dentist may refer you to a dermatologist. Peri-oral dermatitis is usually diagnosed by visual examination, looking at the characteristics of the rash and paying close attention to the type of rash and its exact location. In most cases no tests are needed but sometimes a biopsy or blood test may be needed to eliminate other conditions. It can, however, be difficult to treat taking up to a few weeks and many people get frustrated by the temporary worsening of the condition. It is important to eliminate the use of any topical steroid creams including non-prescription hydrocortisone. All medications, moisturizers, lotions, creams or ointments, prescription or non-prescription should be stopped and a mild soap or soap substitute should be used for washing. When steroids are discontinued the rash may flare up and appear to worsen for days before it starts to improve. Resist the urge to put any kind of cream on your face since it will just delay the clearing of peri-oral dermatitis. Antibiotics are the most commonly used medication for treatment. A recent review of available research on the topic by the US Preventive Service Task Force found oral tetracycline antibiotics to be the most effective; prescription doxycycline 50 to 100 mg by mouth twice daily, minocycline 50 to 100 mg by mouth twice daily, or tetracycline 500 mg two to four times daily. The treatment can last up to several weeks but once the skin has resolved, the antibiotic should be stopped or tapered over a four-to-five-week period. A topical antibiotic (clindamycin lotion twice daily or metronidazole lotion), and an over-the-counter topical anti-pruritic (itch) lotion such as pramoxine 1% lotion can also be helpful in less severe cases. Topical ketoconazole (an anti- fungal and/or yeast) cream can be beneficial especially in patients with associated seborrheic dermatitis. For children, pregnant women, and milder cases of the condition individualized topical therapy is generally recommended. One recent study suggests topical agents (calcineurin antagonists) that work by decreasing the body's immune system, as alternative therapy for those who do not respond to traditional treatment. With some individuals the condition clears up and remains in remission, but others may see a relapse over time. In these instances the same treatment can be effective in managing it. If you are having a difficult time figuring out the nature of a rash around your mouth, check in with your dentist or physician. Share a complete history of any topical steroid use as well as other products that could inadevertantly be exacerbating it or leading to a recurrence. Remember that even though peri-oral dermatitis can be a chronic condition, it can be managed quite well over the long term. If the rash recurs, you should be referred to a dermatologist to check or review the diagnosis and treatment.